Welcome to the Si�n Project Group web site. 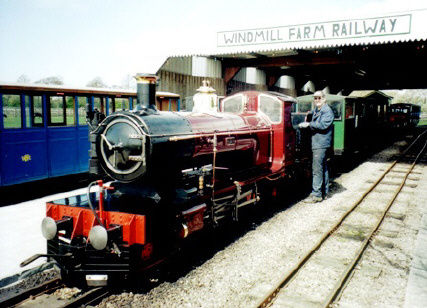 We are a sub-group of the Ravenglass & Eskdale Railway Preservation Society, formed to purchase the 15" gauge locomotive "Si�n" and restore her to her original condition. 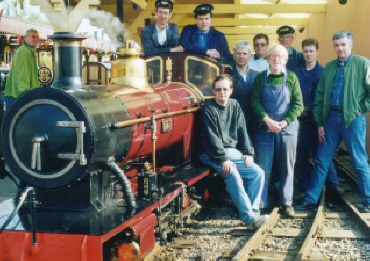 < Nine of the Si�n Project Group members at Ravenglass in April 2000. From left to right:- Geoff Holland, Andrew Graham, Owen Ryder, Terry Taylor, Danny Martin, Stan Buck, John Turner, Chris Mounsey and Steven Ryan. Associate Membership If you would like to keep up to date with Si�n's latest news, then why not become an associate member. Click on the "Friends" button at the top of this page.